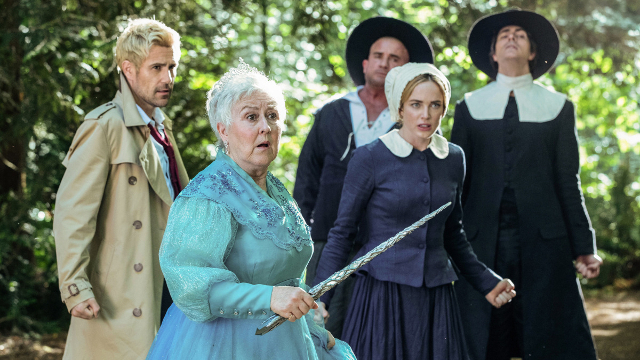 Legends of Tomorrow season 4 episode 2 sees Constantine join the crew aboard the Waverider after helping the Legends deal with a unicorn in the previous episode. After interfacing Constantine’s magical bones with Gideon’s computer, the team is sent to Salem during the witch trials in the late 1600s. The magical disturbance is not a witch, but a fairy godmother who has attached herself like a revenge-seeking parasite to a young woman whose mother is on trial for witchcraft. Constantine is ready to send the fairy godmother to Hell, but the fairy explains that she is bonded to the girl. If Constantine sends the fairy to Hell, the girl gets dragged down with her. The team needs to find a way to get the girl to release the fairy godmother so that Constantine can deal with the magical anomaly. The fairy has no intention of being separated from her host and breaks the girl out of the Waverider where the Legends were keeping her, turning Ray and Mick into pigs and sealing Constantine’s mouth in the escape. Nate sticks around Washington, D.C. to reconnect with his father, but conversation during dinner turns sour when Nate can’t pay. While crashing at the Time Bureau’s offices, Nate agrees to help Ava with her budget presentation to acquire the funding needed to keep the Bureau open. When Nate discovers that it’s his father who is to receive the presentation, Nate backs out, sending Gary in with Ava. The presentation goes as bad as it possibly could have, with Nate’s father telling Ava that unless she can produce proof that there are magical attacks posing a threat to the timeline, the Bureau will be shuttered. Ava tells Nate that she needs him to help, not because she wants him to ask his father for money, but because he’s a hero and that’s what the Bureau needs. 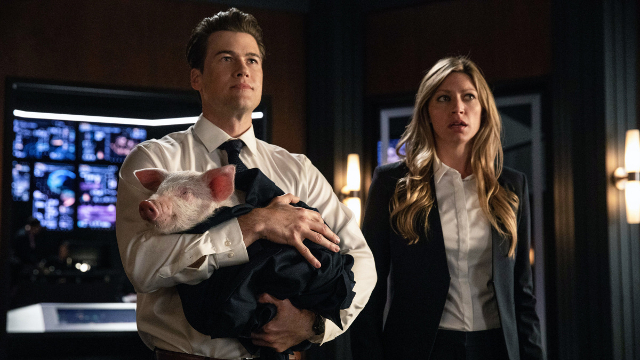 Nate returns to the Waverider in search of evidence, finding Ray, who is still a pig. With evidence of magic and Nate’s super abilities on display, Nate’s father agrees to the funding. With the funds secured, Ava offers Nate a position with the Bureau, which Nate accepts. Unable to intervene to save her own mother in the previous episode, Zari works to free the accused woman from the villagers. Zari is not able to respect the woman’s right to choose to face her accusers. While the woman is being tortured in public, Zari uses her powers to attack and nearly kill the townsmen. Realizing that she’s about to cross a line she can’t come back from, Zari stops and is arrested. Back aboard the Waverider, Sarah commiserates with Zari over their shared anger over losing loved ones and promises Zari that they can work through it together. What did you think about Legends of Tomorrow season 4 episode 2? Let us know in the comments below!